As a security contractor, government civilian, and military officer, Myke Cole’s career has run the gamut from counterterrorism to cyber warfare to federal law enforcement. He’s done three tours in Iraq and was recalled to serve during the Deepwater Horizon oil spill. He recently joined the cast of the TV show Hunted on CBS as part of an elite team of fugitive hunters. All that conflict can wear a guy out. Thank goodness for fantasy novels, comic books, late-night games of Dungeons & Dragons, and lots of angst-fueled writing. 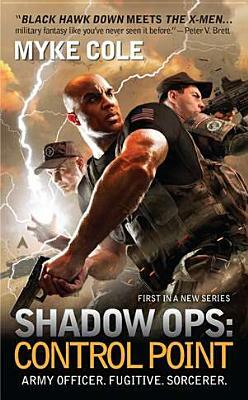 Myke is the author of Javelin Rain and Gemini Cell, prequels to his Shadow Ops novels, which include Breach Zone, Fortress Frontier, and Control Point.